The first edition of Live Cinema Festival takes place in Rome from September 17 to 20, 2014 in Teatro Quarticciolo. Live Cinema Festival is a live performing exhibition that explores and promotes all the artistic trends linked to “Live Cinema” term, through performances executed by artists from Italy, Germany, England, Holland, Poland and Belarus, which made this narrative technique their stylistic code. “Live Cinema” means an experimental narrative technique applied to audiovisual performances, that produces a simultaneous and in real-time creation of sounds and images in which the traditional guidelines of narrative cinema, represented by the subjectivity photographed by the camera, expand in a wider conception. 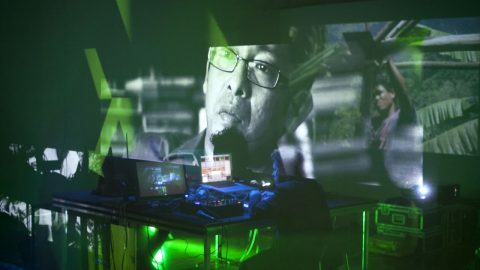 “Cinema” is here intended as a simultaneous creation of images and sounds that interact each other and take shape in a synaesthetic approach that results in audio-video performances realized in real-time, where the viewer’s perception is in constant tension between experimentation and re-enactment. The performances proposed in this first edition tend to explore issues related to social issues and new media, but also to more introspective concepts emerging on the screen in a new way enriched by new languages and new meanings. Live Cinema Festival is supported by Roma Capitale and it’s one of the selected project of “Estate Romana 2014”. Its purpose is to enhance, through the exhibition of 8 artists, one of the city’s suburban areas which, thanks to a program that combines emerging and well-known artists, could become a new center of cultural aggregation. Live Cinema Festival is a cultural and artistic project promoted by Flyer communication and co-produced with LPM – Live Performers Meeting, FLxER.net, Linux Club, Free Hardware Foundation and Improvearts in collaboration with SIAE ed ACEA and approved by AVnode.